I imagine many of you are getting ready to boil eggs this week, either to decorate for Easter or to include at a Passover seder. I loved the annual event of dyeing Easter eggs when I was a child. (It also meant a basket full of candy was only a few short days away. ) My mom would buy a dozen eggs and my 2 sisters and I each took 4 eggs to dye. It never seemed like enough eggs to us. But whatever we decorated would also have to be eaten, because perfectly good food was not thrown away in our house. So 12 seemed to be a good compromise. I actually liked hard-boiled eggs and I still do. A quick breakfast for me is a boiled egg or two with a sprinkle of sea salt and a piece of toasted millet bread. 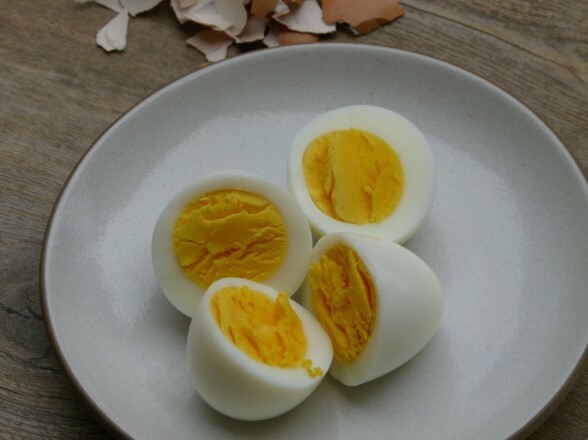 Eggs are a great source of inexpensive, usable protein. I’m so glad research is showing that the dietary cholesterol in eggs is nothing to get worked up about. People used to think that foods high in dietary cholesterol increased one’s blood cholesterol, but it’s really saturated fat that seems to be the culprit and most of the fat in eggs is unsaturated. In addition, the phospholipids in the yolk interfere with our absorption of the yolk’s cholesterol. Now you’re not going to imagine I said something which I didn’t and go hog wild eating eggs like crazy every day, are you? Good. We still need to emphasize plant foods, people. Sadly, my mom’s hard boiled eggs always came out slightly overcooked and with that unattractive green ring around the yolk, so I was never super enthusiastic about eating more than I needed to. So on the eve of the great hard boiled egg cook-off, let’s figure out once and for all how to prepare a perfectly cooked hard boiled egg. I’ve done a few videos for the amazing website, The Chalkboard, including one on boiling eggs which I’ve inserted below. Click here to see the original post. Once we’ve got this down pat, on Friday I’ll give you my favorite way to make egg salad, as well as few other creative ideas for eating hard boiled eggs, that way you don’t have to worry about what in the world you’re going to do with them all the day after. Fresh eggs are harder to peel, so if you are getting them right from the nest or from the farmer’s market, it’s best to wait a few days before boiling them. If this isn’t possible, add a half teaspoon of baking soda to a quart of water to make the cooking water more alkaline. Also, allow the eggs to firm up in the refrigerator before peeling. 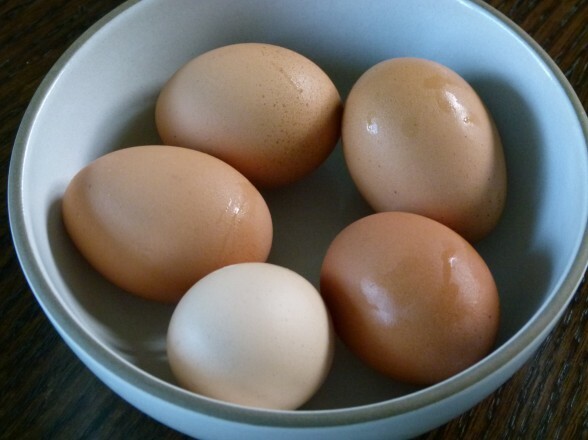 Cover eggs in a pot with cold water and plenty of room to move around. No one likes cracked shells. Bring the water to a boil and then turn off the heat, cover your pot and set your timer for 10 minutes. Why not boil the eggs for 10 minutes? Cooking the eggs in boiling water will overcook them, resulting in a rubbery white and a dry yolk with that unattractive ring around the yolk. You want a solid, but tender white and a moist yolk. Trust me, you do. After 10 minutes in the pot, submerge the eggs in ice water to stop the cooking process, just like blanching vegetables. Either remove the eggs with a slotted spoon and transfer them to a bowl of ice water or drain the eggs in a colander and run them under very cold water. I usually run them under cold water if I want to eat the eggs right away and I want them to be slightly warm. But for decorating, ice water is the way to go. Place the eggs in a pot that’s big enough so the eggs won’t crash into each other. 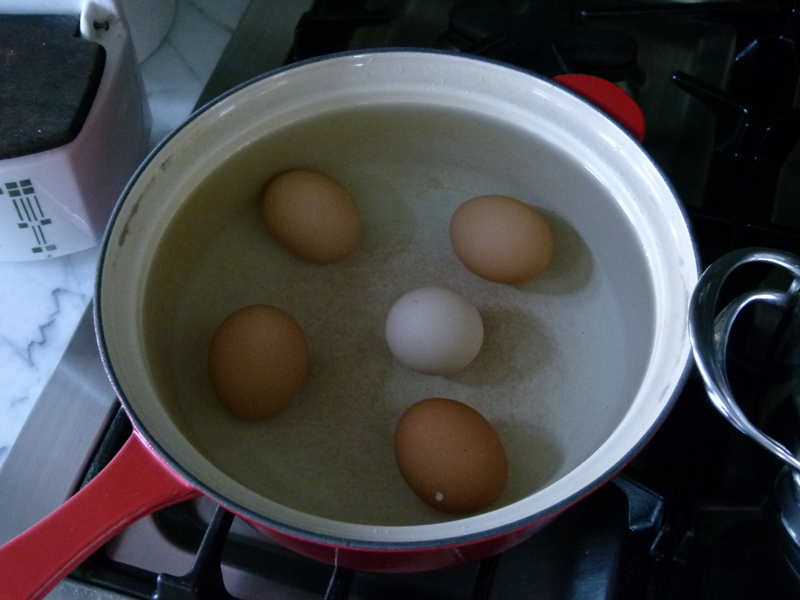 Fill the pot with enough cold water to cover eggs by an inch. Put heat on medium-high and bring the water to a full boil. Cover the pot, turn off the heat and set a timer for 10 minutes. 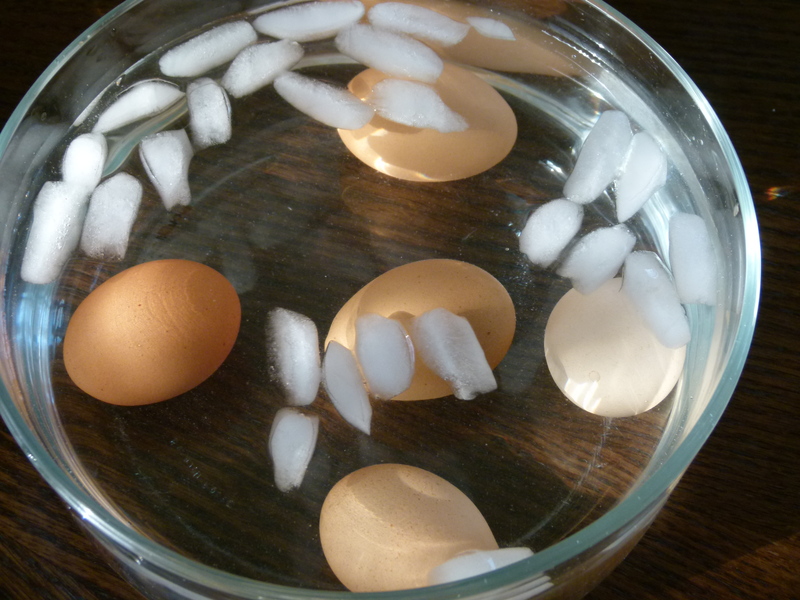 In the meantime, prepare a bowl of ice water to accommodate the eggs. When the timer goes off, transfer the eggs from the pot to the ice water bath with a slotted spoon. Or drain them in a colander and run them under cold water if you’d like to eat them immediately. Store them in the refrigerator for up to 5 days. I have tried it this way….multiple times. Tired using older eggs, etc. etc. But peeling them is sooooo much harder this way. The yolks look awesome – but the whites are awful. So I’ve gone back to the other way of boiling the water and then putting them in – and they peel fine. But – the yokes are so so! Uggh! Yes – I do submerge the eggs…the yolks turn out perfectly! But the whites do not. I live in Colorado – so my guess is it’s the altitude….things really do vary a bit with the altitude…. Yes, altitude can mess with cooking, but it never occurred to me that it would affect egg whites. So interesting! Thank you for the great tip !!! first time in my life my effort to make hard boiled eggs worked. This method is pure magic. Can’t wait to try the baking soda trick (and maybe the pin prick as well). Our girls have been pumping out the eggs, and they never seem to be “old enough” to peel well! Thanks to your post, I finally boiled eggs I absolutely love! I let them sit for just 5 mins after the water comes to a boil and get a semi-soft yolk that is just perfect. I’m following your steps completely but still struggling with the peeling part. Mine go straight into the fridge right after the ice bath so I’m not sure what I’m doing wrong. I’ve read a bit about adding salt to the water when boiling but also learned that the cooking time needs to be adjusted if ones uses salt. Do you have any suggestions on what I could do differently to ensure smooth peeling of the shell? Really the best tip for easy-to-peel shells is boiling eggs that aren’t super fresh. All I do to peel is lightly smash the egg against a countertop or dishtowel and roll it a little and peel. Hope that helps! I will try that, Pamela! Thanks so much! Interesting tip about pricking the shell. I have read about doing that, but I’ve heard mixed results. I’m glad to know that it works. Thanks for sharing! you need to prick the right end of the egg – i.e. the flatter end, where the air pocket sits. otherwise, as the temperature of the water rises, the air expands and hence the shell cracks. mind you, pricking the shell without cracking it isn’t easy either…. Hi athea. Yeah by the wide end I meant flatter end. I don’t pin my eggs anymore tho because I realize my success with them was only because they were not as fresh all those times. The baking soda does work well tho like Pam suggested. My eggs didn’t crack when I pinned them, but if you still do that you may want to try a thumb tack vs a needle. I usually have 10-12 hard boiled eggs with some type of homemade muffin of some type usually always on hand for quick breakfasts. The eggs taste great but look horrible from attempts of peeling. I am so excited to try refrigerating them first before I peel my eggs… we have been getting fresh eggs from my brother in law for the last couple of years and we have tried so many different ways to peel them where they look edible. Thanks for sharing all the great tips on your website. Oh Sariah, how lucky you are to have such a generous brother-in-law bearing fresh eggs! However, the freshness of the eggs is the problem with peeling. You can leave the eggs in the fridge a few days before cooking, which will help or just try the baking soda tip. Thanks for writing in! When you store the eggs in the refrigerator, do you peal them fist? Is it easyer to peal them warm or cold? Great question! I store hard boiled eggs unpeeled in the refrigerator because I think it makes them last longer and they don’t dry out. As for peeling, in general it is slightly easier to peel them while still warm UNLESS the eggs are super fresh in which case you’ll have an easier time if you refrigerate them.